Speck in South China Sea becomes a great barrier in Beijing-Washington diplomacy. On old British Admiralty sailing charts, the Spratly Islands were marked “Dangerous Ground”—to be avoided. 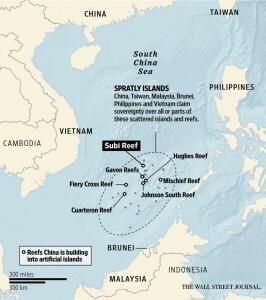 Several reefs in that part of the South China Sea area are named after sailing ships dashed to pieces on the sharp coral. The leaders of the U.S. and China ignore those warnings at their peril. Since China began ballooning several of the half-submerged hazards a few months ago using advanced dredging techniques, the Spratlys have become a test of wills between U.S. President Barack Obama and his Chinese counterpart, Xi Jinping. The U.S. fear is that China is building fortresses to pursue its territorial claims through military means; last month, Mr. Obama condemned China for using “sheer size and muscle” to intimidate its neighbors. After he took power in 2012, Mr. Xi began running a committee called the Central Leading Small Group on the Protection of Maritime Interests, according to a report by the Brussels-based International Crisis Group that drew on interviews with leading Chinese foreign-policy analysts, some of them government advisers. Almost at once, China’s cautious approach to maritime disputes began to look impulsive. The shift was exemplified by China’s decision in May 2014 to drag an oil-drilling rig into disputed waters off Vietnam, an unprovoked move that shocked Hanoi. The report quotes one unnamed Chinese analyst as saying that when it comes to territorial issues, Mr. Xi “wants to go big and go fast.” That’s been the hallmark of the island-building project. 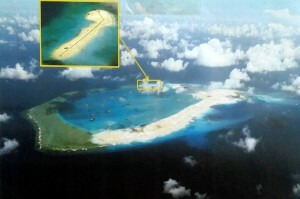 China views the minuscule geographic features it controls in the Spratlys as embarrassing leftovers: The Philippines, Vietnam and other claimants all helped themselves to the largest islands in the decades after World War II when China was too poor and distracted to notice. The Philippines, Vietnam, Taiwan and Malaysia all have outposts big enough for airstrips—and have built them. One of Vietnam’s has a Buddhist temple with monks. As for China, a few of its eight reefs boast a couple of bare rocks that jut out of the waves. That’s it. This is an intolerable situation for Mr. Xi, made more irksome by Manila’s decision to launch a legal challenge to China’s territorial claims at a[the] U.N. It has become an obstacle to the central mission of his presidency, which is to establish China as a great nation on a par with America, one that can project military power in its near waters and beyond.